N.B. This article was originally published as part of my weekly ‘Island Living’ series for the Today’s Zaman national newspaper in Turkey. Unfortunately in a move to clamp down on press freedom in Turkey, the AKP took over the Zaman Newspaper, shutting down the English version and deleting its entire archive. As such it appears in word document form. “Show! Turkish Show!” bellows a squat bald man wearing a captain’s hat and a Madonna-style wireless mic. A curious deck full of tourists, roused from the time-consuming business of taking selfies, look over. The showman pulls out a cucumber (a cucumber!) from his box of tricks and manages to elicit the required amount of ooohs from his audience before demonstrating the awesome powers of the peeler he is selling. It is my 7th time seeing the ‘show’ whilst taking the ferries between Istanbul and the Princes’ Island over the past four days. I pull my hat down lower, try harder to concentrate on my book and wonder whether I’d made the right decision. For me, like many other Istanbul dwellers, the Princes’ Islands have long been a place of retreat; somewhere to head for when the heat of the city gets too much, or when my polluted lungs gasp for a breath of fresh air. They sit tantalizingly out of reach from the city proper, faint smudges on a blue horizon that make up an archipelago of nine islands, each with their own individual charms. During the summer months their grand old wooden houses are occupied by rich families lucky enough to have a summer home passed down through the generations. Throughout the year, a steady stream of tourists flock here – for a romantic fayton (horse-drawn carriage) ride in the winter, or to enjoy the luxuries of the beach clubs in the summer. Everyone has a favorite island, perhaps even a secret spot they visit it time and again, yet are loathe to reveal its whereabouts less it should suffer the curse of popularity. Visitors may marvel at the picturesque streets and relaxed pace of island life, yet very few give serious consideration to actually living here. Particularly not during the winter months, when cold winds blow off the surrounding sea, and the buzz of the summer fizzles out to a barely audible hum. Yet this is exactly what I’ve decided to do. After three years spent living in the heart of the city, I decided it was time for a change. I considered leaving Istanbul altogether, but found myself unable to part with the city I now call home. When I first arrived in Istanbul (supposedly for a week’s visit), I found myself swept up in the intoxicating whirlwind that is Istanbul life, a week turned into a month, a month into a year and before I knew it I was hooked. Living on the islands allows me to keep a hold of the city, but to also have some time apart. I am fortunate to have many good friends in the city whose guest rooms are always open to me. I can still make that ferry trip several times a week if I want to, and reap all the benefits that Istanbul has to offer. At the same time, I can slow down my pace of life. I won’t be able to go out every night, there’s a giant body of water to remind me of that. Instead I’ll have to be more thoughtful about how and when I socialize. Rather than hoping to bump into people or calling them for a beer at 11 at night, I will have to schedule when I see my friends, and make each time count. It’s not the first time I’ve stayed on the islands. Last summer some friends and I discovered our own little secluded beach on Kınalıada and we barbecued there beside the water. We’d brought tents but discarded them in favor of sleeping under the stars with a rakı-induced glow (and a fire) to keep us warm. The fire went out, the waves lapped at our toes, and the local teenagers refused to be quiet, but I remember it fondly. The year before that, I had a sprained ankle when my mother came to visit. My crutches foiled our plans of going to Edirne for the weekend, but we could still manage to take a ferry and a fayton. So we found ourselves on Heybeliada, where we checked into the delightfully dated and garishly pink Halki Palace hotel for the night. Admittedly we weren’t aware that a tango convention was taking place, and the dancing went on through the day and into the night. Surrounded by dancers and sitting in a corner with my foot in a cast, the irony wasn’t lost on us. Although as I write this I’ve only been living on Büyükada for a few days it already feels different to being on holiday here. Each time I step out of my bright little apartment, I’m taken aback by the beauty of the street where I’m surprised to find I actually live. Unlike in Istanbul, I’m not kept awake by the noise of taxis beeping their horns, because are no cars here (save for the rubbish collectors and the forestry commission pickup). Occasionally I hear the whirr of electric pushbikes that whizz past, and during the daylight hours the faytons ply their usual tourist routes. But that’s it. No buses, no dolmuşes, no trucks, and no reckless motorbikes crisscrossing the city to meet the demands of Yemek Sepeti customers. The air is so clean here, it tastes sweet to breathe in. 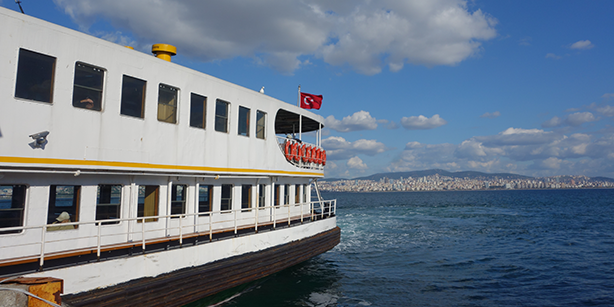 I catch glimpses of Istanbul when climbing the hills or walking down to the water’s edge – not the city centre of course, but its ever expanding Asian outskirts of Kartal, Bostancı, and Pendik. A haze hangs over the clustered apartment blocks. It’s only a short ferry hop away, but a world apart. I have chosen to live on Büyükada. I fell for the first apartment I viewed, in a street a couple of blocks back from ferry terminal, and decided I need look no further. It feels like the right move. The clue’s in the name; Büyükada is called ‘big island’ for a reason. It towers over its neighbors in size, meaning it also has the largest year round population. There’s life here. Maybe not life that compares to that of Beşiktaş on a Saturday morning, Asmalı Mescit on a Friday night or Istiklal Caddesi at, well, any time. But I enjoyed three years of that. It is time for a change. I’m lucky that working as a freelance writer means I don’t need to commute. Currently, I still enjoy the ferry rides between my new home and my old one. It’s a time to think, to read, to work, to drink tea, and contemplate my new life. Or rather it is when it’s not being punctuated by opportunist salesmen putting on their pantomime-like performance. I admire their entrepreneurship (they certainly seem to make a lot of sales) but I imagine that if I were making the twice a day five days a week my enjoyment of the journey may begin to wane. Even with the shows though, it still beats being crushed on the Metro, or sitting unmoving in Istanbul’s infamous traffic. Still, I wonder how island living is going to work out. How difficult will it be to make friends here? Will the locals share their island’s secrets? Can I really give up the bright lights of buzzing Beyoğlu? Will the isolation get me down? What will the neighbors make of the young English woman setting up home in their street? How many times can I cycle around the island before I go stir crazy? What happens when winter storms render the life-line ferries inoperable? And will I cave and buy a peeler? (I do actually need one come to think of it.) I’ll be sharing all in this column.